The above images depict the cabin of VH-EBA circa 1960. At this time, the aircraft is believed to have been configured for 36 first class (9 rows of 4) and 60 tourist class (10 rows of 6). One of the novel features of the 707-138 cabin was the so-called dome light. There were three of these in the cabin ceiling. The image of the tourist cabin shows two of these dome lights. A third was located forward in the first class cabin. In daylight, the dome lights were an opaque milky colour. At night, when the cabin was darkened, they had a blue colour. 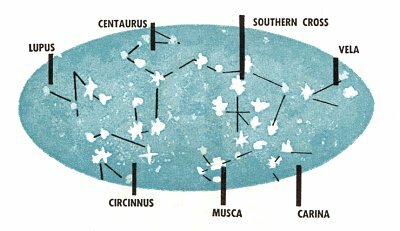 A number of small white lights shone through a plate onto the plastic dome creating the impression of the night sky. On the Qantas aircraft, this display was based on the night sky over Sydney at approximately midnight in April or at 8pm in June. There were three dropped ceilings located forward, centre and aft for the stowage of life rafts and emergency equipment. As the rafts were heavy, there was a spring assist device to ensure that the access panel opened slowly. The forward and aft dropped ceilings also housed gravity feed potable water tanks. These tanks incorporated a float type contents gauge which could be viewed from the cabin. 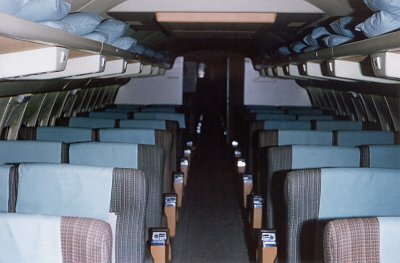 The interior of the 707-138 was described as follows in a Boeing publication dated May 1958. It should be noted that this document may not necessarily reflect the actual specification at the time of delivery in 1959. 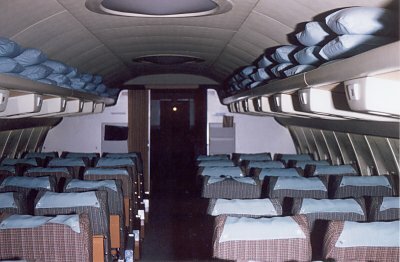 The standard interior arrangement of the Qantas 707-138 airplane furnishes accommodation for 40 first class and 50 tourist passengers with a 4 place forward lounge. Reclinable seats are arranged five abreast with triple seat units on the left, double seat units on the right and a 20 inch aisle. Spacing between seats is 40 inches. Seat attachment tracks in the floor permit conversion to alternate seating arrangements for all first class, tourist or mixed passenger service or additional lounges. A movable partition containing a closure may be installed at various locations in the passenger cabin. The lounge is easily replaceable with standard seats. Foldable and reclinable double seats are installed at the entry areas for the cabin attendants. The aft seat is equipped with shoulder harnesses. Cabin attendant panels are located over the service doors in the forward and aft galleys. An attendant call switch is installed in each lavatory, lounge, berth and on the passenger service units above the seats. Coat closets and a stowage space with individual compartments for passenger effects are located in the area of the aft entry door. Overhead racks for stowage of blankets, pillows, hats etc., furnish a steadying support for passengers walking in the aisle. A folding writing table is provided at the aft attendants' seat. Magazine racks are installed on forward and mid-cabin partitions. A berth and rest area for the crew and four berths for passengers are located in the forward passenger cabin. Provisions are made for the installation of 10 additional berths in the aft portion of the passenger cabin. Two Qantas furnished double unit galleys, one on either side of a service door, are provided with electrical power, lighting, ventilation, water supply and drain. All galley units are readily removable. Two of the units may be replaced with passenger seats. Two separate 35.8 Imperial gallon water systems supply water for washing, galley and drinking purposes. Separate lavatory accommodations are furnished for men and women. Five lavatories, two forward and three aft, are equipped with a ground serviced flushing type toilet, wash basin with hot and cold water, mirror, electric razor outlets, dispensers and miscellaneous utility items. Dual "dry shave" facilities, comprising two mirrors and electric razor power outlets, are installed against the bulkheads above the cabin attendant's seats in both the forward and aft passenger entrance areas. Passenger cabin windows, spaced at 20 inches for maximum visibility, include anti-fogging and anti-glare provisions. Anti-fogging is accomplished by internal ventillation of the double pane structural windows and the protective inner window. The inner window is tinted to reduce glare. A track-mounted opaque shade may be pulled down over the inner window. Main cabin illumination is furnished by fluorescent cove lighting under the overhead hat racks, large variable effect dome lights and lights in the dropped ceilings. All passenger cabin lighting is controlled from the cabin attendants' panels. Passenger service units are track-mounted to the underside of the hat racks. Each contain four oxygen mask connections, an oxygen mask for each seat, three fresh air outlets, three individually controlled reading lights, an attendant call button and a back lighted seat row number sign. On the aft side of each unit are back lighted seat letter signs, no smoking and fasten seat belt signs. Alternate pasenger service units contain a public address system speaker. Oxygen masks, speakers, passenger signs and attendant call buttons are also located in each lavatory, lounge and berth area. An oxygen outlet and mask are furnished over each attendant's seat. A pressure sensitive valve installed in the passenger oxygen system will turn on the oxygen automatically at approximately 15,000 feet cabin altitude and cause oxygen masks to be dropped for immediate passenger use. Four portable oxygen cylinders are made available for individual supplemental or therapeutic oxygen requirements. Emergency equipment and life raft stowage is provided in the dropped ceilings. Escape ropes are stowed at the overwing emergency exits, and escape slides are located over each entry and galley door. Portable CO2 and H2O fire extinguishers and first aid kits are located throughout the cabin. Thanks to Bill Fishwick and Victor Warren.